Necklaces and pendants can be created in a variety of styles with endless design elements and creativity. A 4.6 cm gold-plated silver Mjolnir pendant found in Sweden. 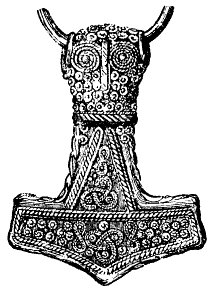 These objects were representations of the hammer of Thor, the Norse god of thunder. 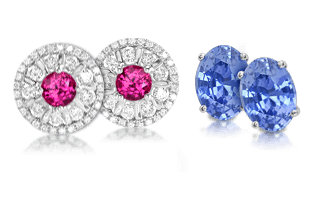 Although used interchangeably, the terms “necklace” and “pendant” actually describe two different and unique types of jewelry with specific elements inherent in each style. 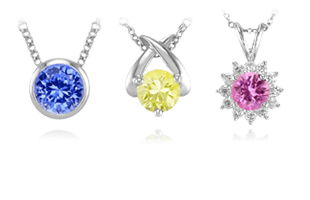 A necklace is a piece of jewelry worn around the neck, and a pendant is a jewel, commonly a slide, locket, or charm, that is worn suspended from a chain. Chains come in an array of styles, varieties, and weights. 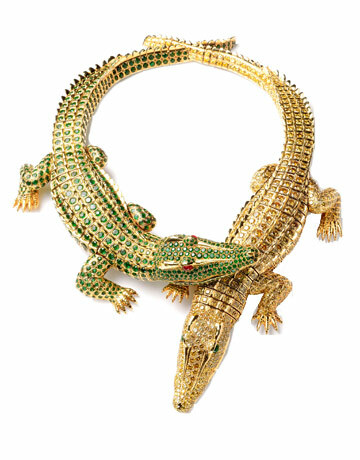 The crocodile necklace commissioned by Maria Felix from Cartier. 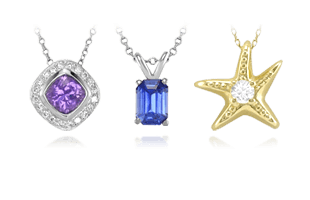 Necklaces and pendants range from discreet and simple to conspicuous and opulent. 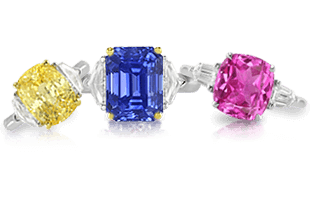 The design possibilities for these jewelry items are almost limitless, but there are a number of common styles worth specific mention as they are truly timeless and appear in trends and classic stylings time and time again. A collar is a broad, often solid piece of jewelry that rides close to the neck. A dog collar necklace is a wide strap of chains, pearls, or beads that snugly encircles the neck. This type of necklace, which is meant to lay flat to the body, was popularized during the sixteenth century for both men and women alike. A choker is a flexible, single or multi-strand necklace that is longer than a collar, hanging just at the hollow of the throat. Chokers are usually 14-16 inches long. Chokers have been around for thousands of years and were a jewelry piece of choice in the earliest civilizations including the Ancient Egyptians and Sumerians. Various necklace lengths. Photo from Artfully Unique Jewelry. Princess length necklaces are 17-19 inches long and hang right below the hollow of the throat. This length is particularly versatile and can be worn with a variety of necklines. Most of the longer lengths refer to pearl strands or bead necklaces: matinee at 20-26 inches, opera at 27-34 inches, and rope at 36 inches or more. 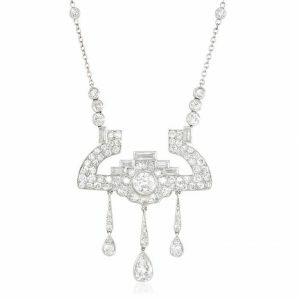 An Art Deco diamond lavalier necklace. A necklace that includes two pendants of unequal length is called a lavalier, after Louise de La Vallière, a mistress of the French King Louis XIV who apparently favored the style. 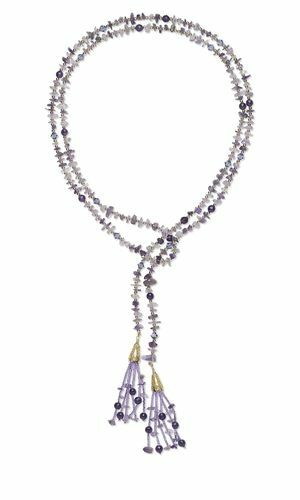 This style is marked by a design that is incredibly well-suited to incorporating large gemstones and pearls in the pendant drops. 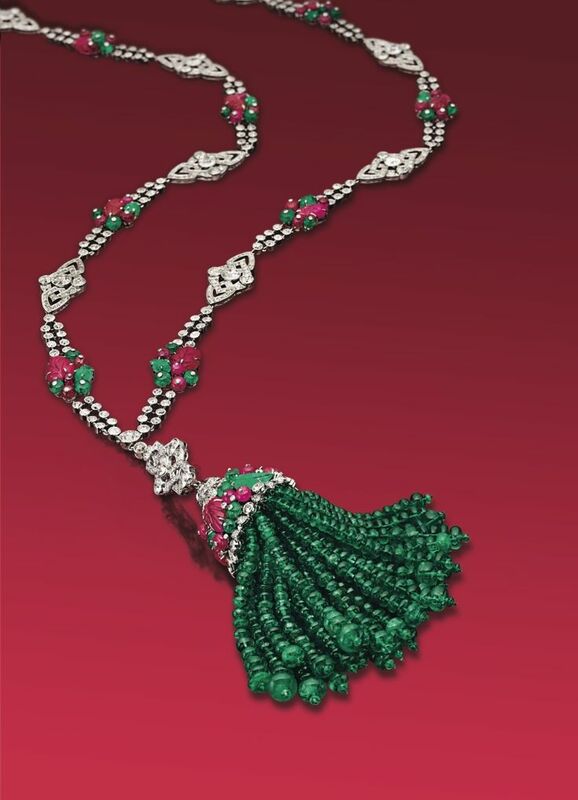 An Art Deco diamond, ruby, and emerald sautoir by Boucheron. 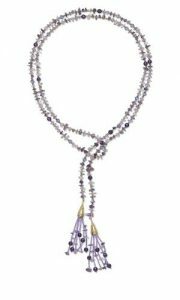 The Art Deco sautoir is a long necklace, usually made of beads, especially pearls, which has a tassel or a pendant at the end. 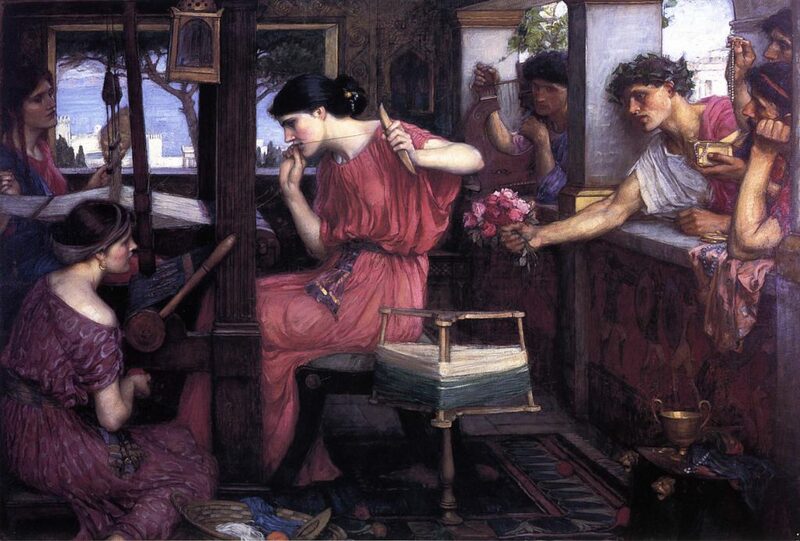 The modern-day sautoir style developed in the early twentieth century as a response to the elongated silhouette created by popular women’s clothing of the time. Lariat necklaces are constructed of two decorated ends of a chain which are tied, clipped, or otherwise fastened together and left to dangle side by side. There is often no specific clasp and they come in a range of styles and materials. To be a true lariat necklace, the piece would need to be at least 30 inches in length. The Snettisham Hoard Great Torc in the British Museum. Photo by Ealdgyth. A torc is a rigid circular necklace, which is open ended at the front, usually leaving a space of 1-2 inches between ending decorative pieces. 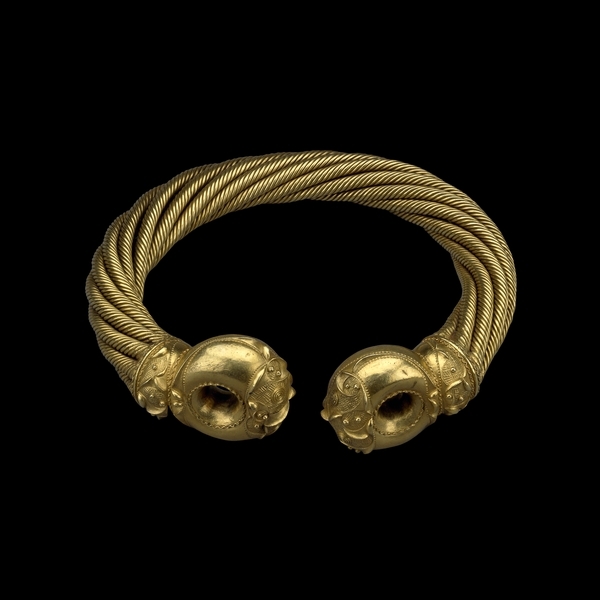 Torcs were popular in Scythian and Celtic jewelry where donning a torc was a symbol of high rank. A cultured pearl torsade necklace with gold and diamond clasp by Cartier. 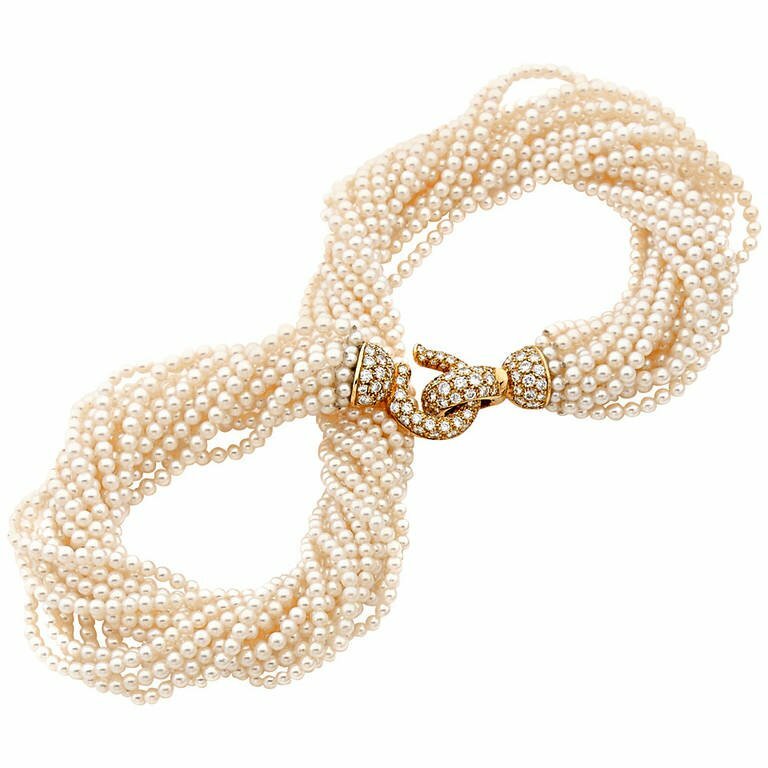 A torsade is a twisted rope of beads or pearls. 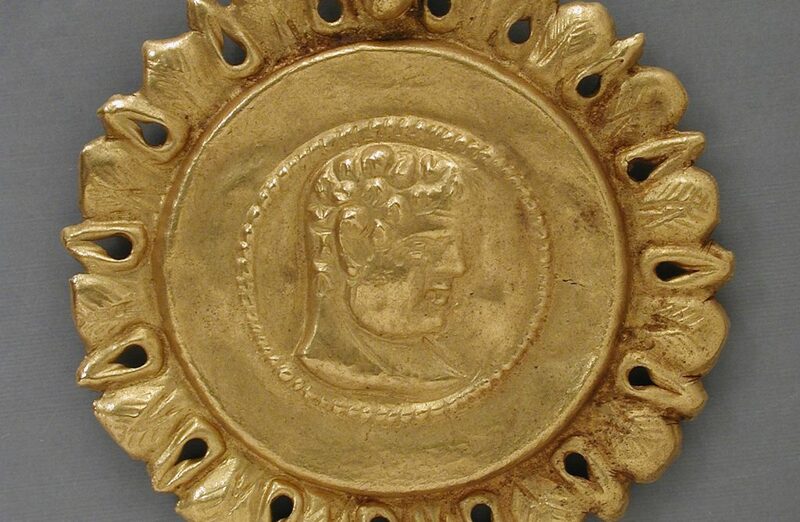 Both torcs and torsades may be worn as bracelets as well as necklaces. The torsade is marked by how thickness, incorporating many strands into its twisted design. 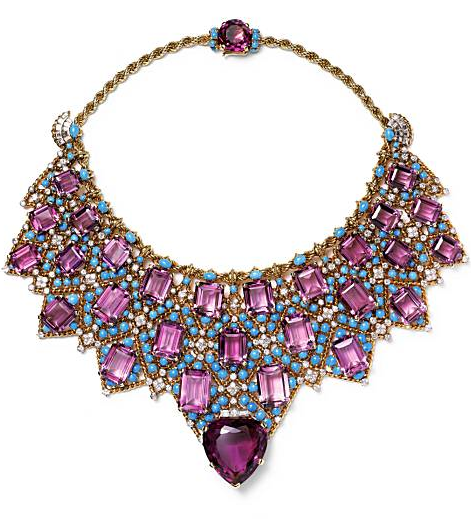 An elaborate Cartier bib necklace featuring amethyst, turquoise, and diamonds. 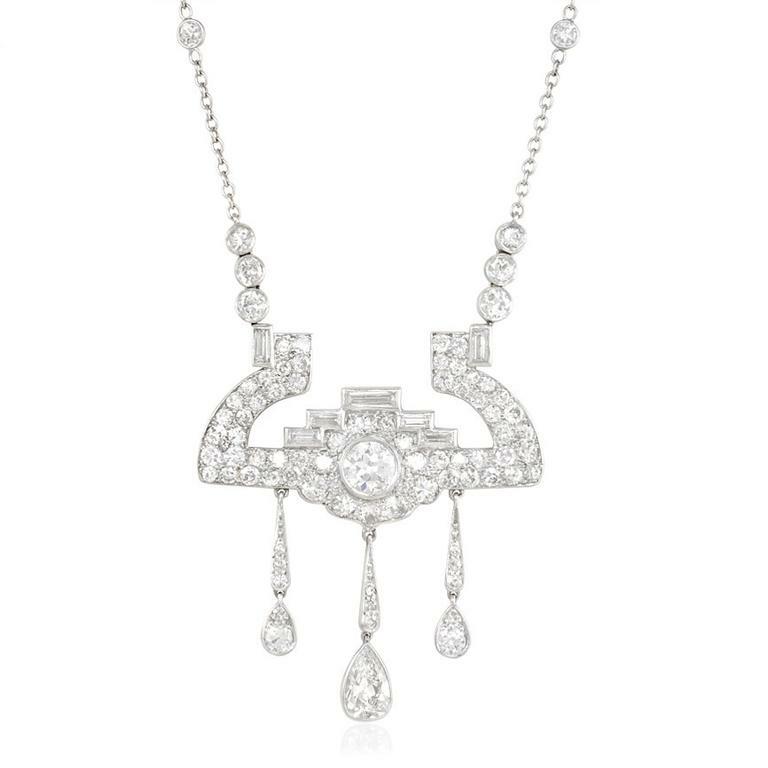 This necklace was designed for the Dutchess of Windsor in 1947. Photo from Style Curator. One of the most elaborate necklace styles is the garland or bib, which drapes across the wearer’s chest and can potentially house many precious stones or pearls. 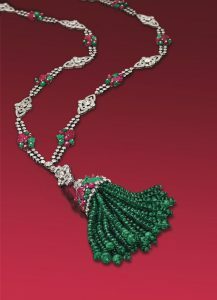 Elaborate bib necklaces set with rubies, sapphires, emeralds, diamonds, and pearls are characteristic of the Mughal and Mughal revival styles. 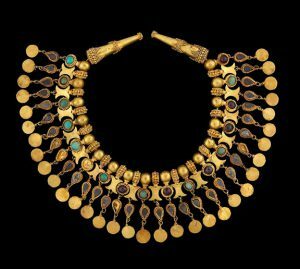 All of these styles have occurred throughout history, and next we explore some Famous Necklaces and Pendants | A Selection from History.